FINAL SALE. 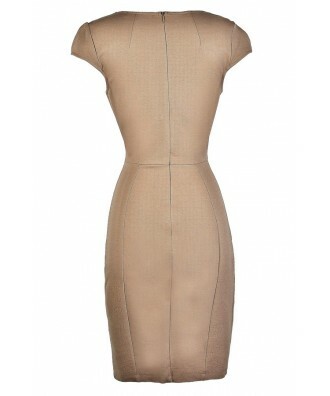 This flattering capsleeve pencil dress is a chic wardrobe staple with a twist--the flirty plunging neckline. The Check Your Calendar Capsleeve Fitted Dress is lined at the bust and made of a heavy fabric with a bit of stretch to it. It has a plunging V neckline, cap sleeves, and a fitted cut. The longer length hemline gives this dress a demure touch. A hidden back zipper completes this dress. The Check Your Calendar Capsleeve Fitted Dress would look nice paired with pumps or strappy heels. This is a great dress for networking or to wear to a wedding or social event. We love the retro-inspired glamour of this dress. Details: Made in USA. 65% rayon, 30% nylon, 5% spandex. Hand wash cold or dry clean. Small measurements: Length from top of shoulder to hemline: 39". Bust: 34". You have added Check Your Calendar Capsleeve Fitted Dress in Beige into Wishlist. You have added Check Your Calendar Capsleeve Fitted Dress in Beige for Stock Notification. 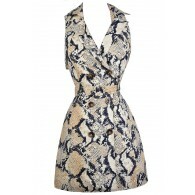 You have set Check Your Calendar Capsleeve Fitted Dress in Beige as a loved product. You have removed Check Your Calendar Capsleeve Fitted Dress in Beige as a loved product.